The music on Constraints & Liberations operates and resides in that state between dreams and reality. The record slowly simmers with a restrained intensity and rarely comes to a boil. The soloists are stellar and never fail to tell engaging stories. 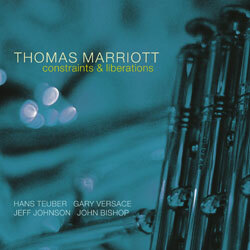 Thomas Marriott’s trumpet sound is as lush and inviting as it comes. “Up From Under” and “Clues” give him plenty of room to slowly stretch out, like a tall man coming to from a deep sleep and remembering how to walk. Pianist Gary Versace is a master at taking simple ideas and developing them until he’s exhausted all possibilities. His solo on “Clues” is exciting, as his increase in dynamics and intensity coincides with the most fruitful developments of his initial statement. Hans Teuber possesses a complex subtone sound and one of the fresher tenor approaches today. Marriott’s rhythm section kills. The bass/drums tandem of Jeff Johnson and John Bishop holds down the Hal Galper Trio and is twothirds of the trio Scenes. Their significant time together has allowed them to share a common musical consciousness and approach.